So it’s raining in Phoenix. To the rest of the world, the fact that it’s raining is no big deal, but here it is headline news. Headline news. And I’m not talking about flood damage or people needing to be rescued – just the fact that it’s raining is big news around here. Just like we take pictures of temperature readings when it’s really hot and really cold, people in Phoenix are posting pictures of puddles! Seriously! Why is it big news when it rains in Phoenix? It doesn’t happen here very often, but a lot of us are transplants from places like Michigan, Minnesota, and Wisconsin. It snows there! I lived in Oregon for almost six years. When it rains there we don’t even get out umbrellas, we just pop our hoods up and keep walking. I think it’s so funny that people who spent decades living in weather won’t go outside if it’s sprinkling once they move here. Since we have so many transplants in Arizona, it’s very strange that people seem to forget how to drive in the rain once they move here. There seems to be two types of rainy day drivers – those who keep speeding and are risk of hydroplaning at any moment and those who drive less than 5 mph. True story: I was the third car back at a light during a rain storm and it took three light cycles to get through the intersection because the people in front of wouldn’t move. Whatever happened to “ease off the gas but keep driving?” I will give Phoenix drivers some leeway because they don’t use the street paint here that shines through water so it can be really hard to see you lane lines. I prefer not to drive on the freeway during the rain, but if I’m on a six-lane street and there are only a handful of cars on the road, I think we can maneuver around each other safely enough. The one legitimate quibble about Phoenix and rain is the flooding. Now, I’m not talking about the morons who need to be rescued because their car floated off when they drove through a flooded street. (Enjoy that $20,000 helicopter bill.) I’m talking about the fact that our city was constructed without any thoughts about rain so it floods literally five minutes after it starts raining. 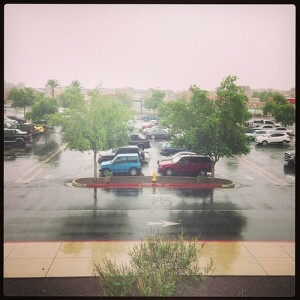 We all know it doesn’t rain much in the desert, but we have monsoons. A lot of the time when it rains, it pours. The rain falls so hard I regularly walk around the house to make sure the skylights are holding. Don’t freak out because it’s raining. You know how to drive in this stuff. If you’ve forgotten how to drive in the rain, stay off the road. If you can’t see the road, it’s too deep to drive through the water. If the fact that it’s raining is the highlight of your day, you need a hobby. Unless you’re a storm chaser – then be careful out there. Another reason why it floods is that our ground is very hard, and not sand like everyone thinks. Very true! Our ground does not absorb water quickly – another reason why we need to have infrastructure to handle the rain. They never planned for it. Crazy.